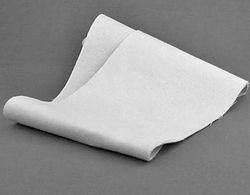 Flannel Backed Canvas 5" X 20"
The Professional Shine Cloth is a quality shine cloth you will see the professional shoe shiners use for a brilliant shine. The canvas backing gives it some body and the soft flannel gives you the shine. We recommend as with the shoe shine brushes, one for colored shoes and one for black shoes only. This keeps the black polish from getting on your lighter colored shoes. Just a note about using a shine cloth. After you have applied the polish and it has set up for a few minutes then you use the shoe shine brush to start the shining process. In doing this you are distributing polish and also taking off excess polish from the shoe. When you have finished shining with the brush then you use the cloth for the final shine and you will not end up having polish caked on your shine cloth.